As you probably know, the ACP Board has issued an official statement concerning FIDE’s decision to award the World Rapid and Blitz championships to Saudi Arabia. The full statement is available here. These actions also directly contradict FIDE’s statutes. It is our sincerest belief that official events must not be staged in countries with discriminatory and oppressive policies regarding gender and/or religion. Such policies deprive many players of participation and damage the image of our game. The ACP Board leaves the decision whether to participate to the players themselves, but we find it important to underscore our position. As a result of constructive cooperation between the ACP, the ECU and the Monaco Chess Club, the European ACP Women’s Rapid and Blitz championship in Monaco was a great success! A record number of participants (91) took part, with 7 ACP Premium-Member wild cards receiving special conditions. To make the event more attractive, ACP contributed 5000 EUR directly allocated for our Premiums. ACP Premium, GM Anna Muzychuk, won the rapid, followed by GM Kateryna Lagno and another ACP Premium, WGM Aleksandra Goryachkina. In the blitz section, ACP Premium, GM Aleksandra Kosteniuk, took gold ahead of GM Kateryna Lagno and ACP Premium, GM Valentina Gunina. Here are the official regulations for next year’s European Individual Championship. ACP is proud to announce it will again provide special prizes totaling 6000 EUR for its Premiums. Wijk aan Zee (GM Matlakov in the Masters, GM Gordievsky in the Challengers, as well as GM Krasenkow, who received the veteran’s spot in the Challengers). These wild cards are based on the ACP Tour standings for December 1, 2017. The traditional Poikovsky tournament (spring 2018). Tradewise Gibraltar Chess Festival (January 22 – February 1 2018) –GM Vitiugov, WGM Goryachkina, WGM Paethz, and WGM Batsiashvili. We are also pleased to inform our members about our latest agreement with one of the best open tournaments in the world: The Chess.com Isle of Man International, which will take place in October 2018. 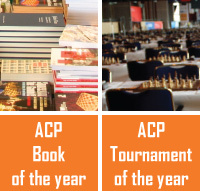 Five ACP Premium Members—three men and two women—will receive wild cards, each endowed with a 1500 GBP starting fee. Please note that two of the wild cards will be assigned to those non-European players (one man and one woman) with the highest score in the ACP Tour standings. Wild cards will be assigned according to the standings for March 31, 2018 (men) and May 31, 2018 (women). We would also like to announce our cooperation with two open tournaments in Spain: Sitges and Lorca. The conditions in Sitges are available here, while in Lorca the organizers will offer full board for two ACP Premiums rated above 2600. The ACP General Assembly will take place between December 15th and 29th. The President will present a State-of-Affairs report, and the Treasurer will present a State-of-Finances report—both reports being subject to member approval. All ACP Members are entitled to submit issues for discussion during the GA. Finally, in early January, we will be running our annual Tournament of the Year contest, where you can vote for your favorite tournaments in various categories. This is a significant rescheduling of the event, so please take note.